Which Restaurant Serves a Morning Meal That's Good for Your Diet? If your mornings are hectic, then you might be one of those people who runs through a coffee shop or the local fast food restaurant looking for a quick morning meal. You'll find a breakfast sandwich on almost every menu. But not all of them are good for your diet. So, how do you find a healthy breakfast sandwich? A breakfast sandwich can provide you with muscle-building protein, carbohydrates for energy, and filling fiber in the morning. But, not all breakfast sandwiches are good for you. In fact, many are high in sodium, fat, and calories. Since you have many different choices at different locations (and you can even make a breakfast sandwich at home), it's smart to compare nutrition facts for your breakfast sandwich before you eat your morning meal. 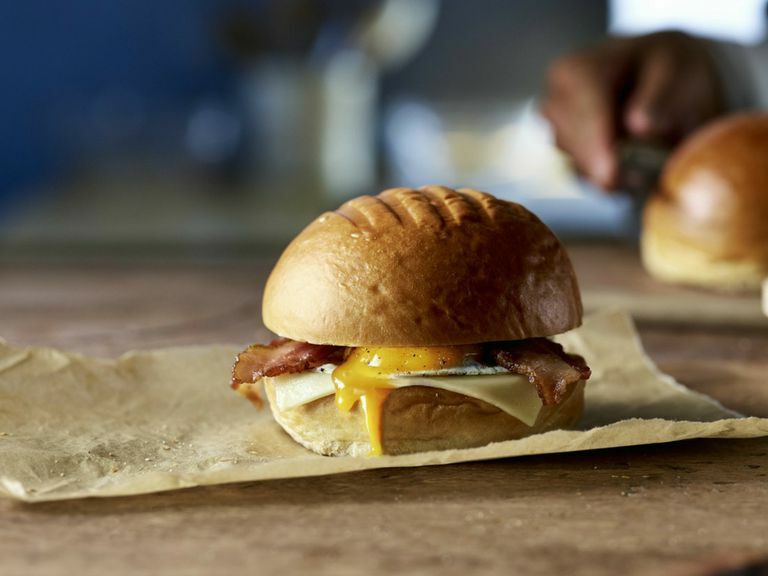 Many different quick-serve and fast casual restaurants serve breakfast sandwiches with a variety of toppings. Obviously, the toppings you choose will make a big difference in the nutritional value of your meal. Higher calorie choices like cheese, sausage, and bacon will increase both the fat and calorie count of your sandwich. You may also get more sodium from a sandwich with those ingredients. Lower calorie sandwich ingredients include choices like egg whites or spinach. Choosing a breakfast sandwich with these will usually keep the calorie count lower and the nutritional value higher. But preparation method makes a difference too. For example, you might see an egg white and turkey sausage breakfast sandwich that is higher in fat and calories than you'd expect. While those ingredients are generally lower in fat and calories, if you cook them in oil or butter, then the sandwich may still provide more calories than you need. In choosing the healthiest sandwich for you, decide which factors are most important to you and then read the Nutrition Facts label to make the best selection. If you want the lowest calorie breakfast sandwich consider the Special K Egg with Vegetables & Pepper Jack Cheese Flatbread Breakfast Sandwich or the Evol Lean & Fit: Egg White, Kale, Roasted Tomato and Goat Cheese Sandwich. If you are looking for the lowest fat breakfast sandwich consider the Smart Ones Tasty American Favorites Canadian Style Turkey Bacon English Muffin Sandwich. If you want the lowest sodium breakfast sandwich and you plan to eat in a restaurant you might choose the Starbucks Reduced-Fat Turkey Bacon & Cage Free Egg White Breakfast Sandwich. At home, the Evol Lean & Fit: Egg White, Kale, Roasted Tomato and Goat Cheese Sandwich is a smart choice. Lastly, you may also want to be careful about the quality of your sandwich ingredients. Not all egg sandwiches are made from "real" eggs. For example, Panera breakfast sandwiches are made from 100 percent real eggs which means that the eggs are freshly prepared, cracked shell eggs and/or egg whites with no additives. In a comment to the press, Sara Burnett, Panera's Director of Wellness and Food Policy said that when the company explored egg sandwiches at some of their competitors they found that "50% of the top 10 fast casual restaurants that sell breakfast have an “egg” made of at least five ingredients, often more." The healthiest breakfast sandwich for you might be the one you make at home. While it takes more time and a little bit of organization to prepare your own breakfast, you have complete control over the ingredients and preparation method when you cook your own meals at home. Need a few ideas or healthy breakfast sandwich recipes? Try these Quick and Easy Egg McMuffin-Style Sandwiches that you can make in minutes. Or add an egg to this Guilt-Free Grilled Cheese Sandwich. Use smart tips to prepare breakfast foods in advance and get creative about different ingredients to include in your meal. Your morning meal is important. Breakfast is (nutritionally) no more important than the other meals and snacks that you consume during the day, but you can set yourself up for hours of high energy and healthier eating habits if you begin with good nutrition. Of course, while it's always smart to cook at home, we understand that there are days when fast casual or prepackaged foods are necessary. Read nutrition facts labels or visit restaurant websites to get important information to keep your healthy diet on track no matter where you dine. What Should You Know About the Best Diet Delivery Meal Plan for You?